Think you might want to own chickens? Now you can try out urban laying hens without a long term commitment! 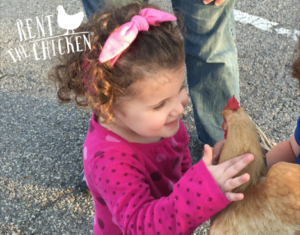 Kip & Ei Farm’s, “Rent The Chicken” provides the opportunity to have “farm fresh” eggs in your backyard. Each rental includes everything needed: a portable coop, at least two egg laying hens, feed for the rental season, and phone and web chat support. Kip & Ei Farm is located in Otis Orchards, WA and consists of Erick & Jan with their two daughters. They are strong supporters of fresh food, close to home. Kip & Ei Farm only offers non-gmo, non-corn, non-soy, locally grown feed for their animals and for Rent the Chicken hens. They also sell farm fresh, free range chicken eggs. Their daughters like to say “It’s the only pet that poops your breakfast”! Rent The Chicken was established near Pittsburgh, Pennsylvania, USA, by Phillip and Jenn Tompkins in 2013. Rent The Chicken has partnered with more than 45 farmers and homesteaders in the United States and locations in Canada that offer Rent The Chicken as an extension of their farm / homestead. Kip & Ei Farm’s “Rent the Chicken” operation services North Idaho and Eastern Washington. Call 724-305-0782 or visit www.RentTheChicken.com for more information.